The Northeast River Crossing is no longer being pursued and work on this study has been discontinued. This follows an announcement on May 25, 2018 by the Province of Alberta to invest in the Highway 38 (Vinca) bridge crossing and direction from City of Edmonton’s Council of June 13, 2018. The need for a potential new river crossing over the North Saskatchewan River in the northeast part of the Edmonton region was identified in a 2011 study prepared for the Edmonton Metropolitan Region Board. The Edmonton Metropolitan Region Board plans and coordinates the growth of the Edmonton region. This future bridge would join Edmonton and Strathcona County and connect Highways 15 (Manning Drive) and 21. It would also provide an alternate route over the river and provide better access to Highway 63 leading north. There is currently no construction timeline for this project. This project involves a partnership of four municipalities and the Province of Alberta. 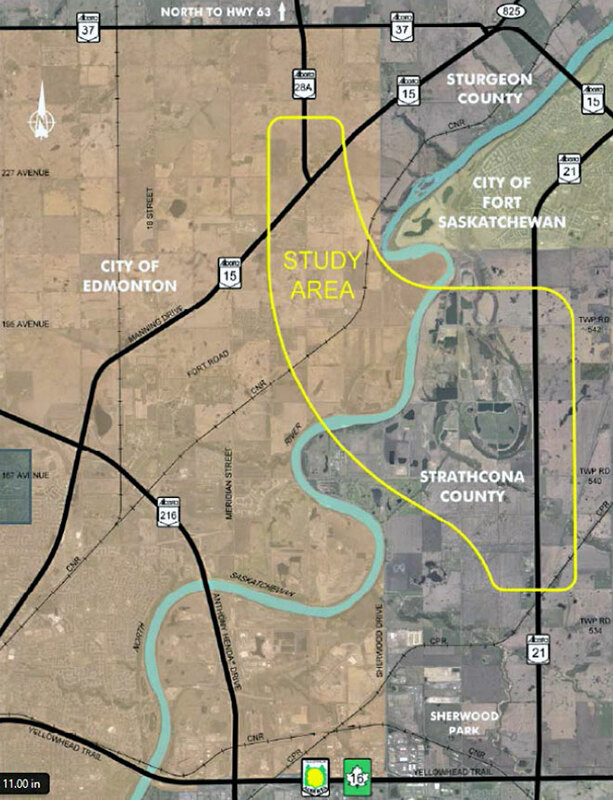 The City of Edmonton, City of Fort Saskatchewan, Strathcona County, Sturgeon County, and Alberta Transportation proceeded with the first step in the planning process for this river crossing: The Northeast River Crossing Functional Planning Study. This study's goal was to identify the long term needs of the area, and recommend an approximate location for the future bridge and connecting roads. The study started in January 2017 and was discontinued in summer 2018 due to the Province of Alberta’s investment in the Highway 38 bridge crossing and direction from Edmonton City Council. Before being discontinued, two phases of public engagement were complete which involved gathering feedback from local stakeholders and the public. The Northeast River Crossing Functional Planning Study involves four municipalities: City of Fort Saskatchewan, City of Edmonton, Sturgeon County and Strathcona County, along with Alberta Transportation on behalf of the province. Public consultation and engagement was available for the residents of all four municipalities. Input from stakeholders and the public helped the partners to adjust the recommendations for the region's future growth and transportation needs. The public was invited to two identical drop-in public meetings for Phase 2 of the Northeast River Crossing Functional Planning Study. Feasible alignment options were presented for input. The public was invited to attend meetings to learn about the project, its purpose and timeline, and to provide input to inform our understanding of the study area. Study purpose, location, history and timing. Planning and managing Edmonton Metropolitan Region growth.